Phoenix is full of burger joints, most have fantastic burgers of their own creation but lack in the build-your-own-burger area. Burger Theory does not fall into that category! Their b.y.o.b. menu is fantastic and full of great options to make your burger all your own. Connected to the Holiday Inn, you might think they are just a hotel restaurant but you’d be wrong. 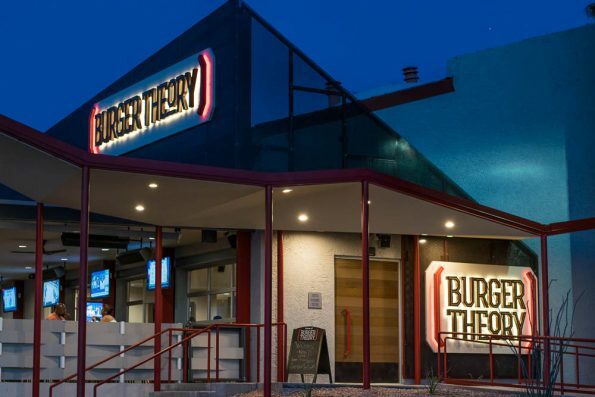 Burger Theory sets itself apart from typical hotel fare and offers a great burger in a fun and casual environment that even locals can (and do) enjoy. We tried our hand at creating our own burgers (and were fairly successful we think) and created 2 very different burgers. 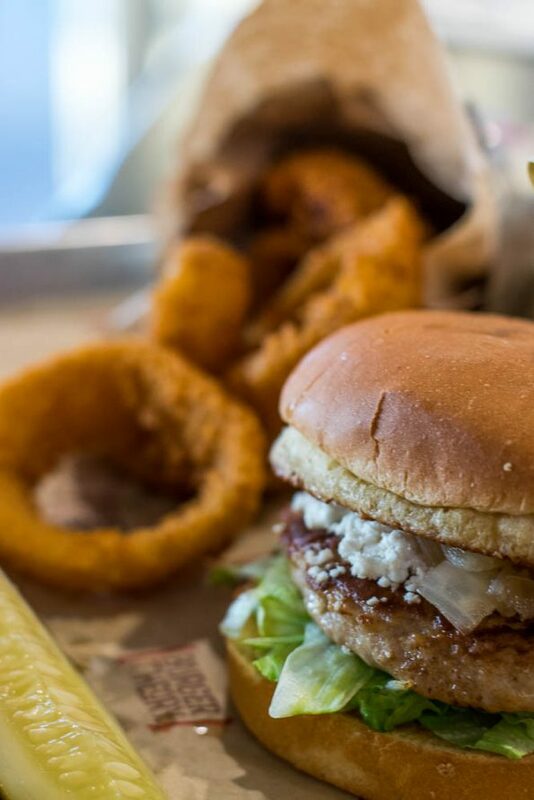 The first burger we created was a turkey burger. The turkey burger’s toppings included: lettuce, goat cheese, grilled onions and mayo. Hands down the turkey burger was the star of the evening. Packed full of flavor and deliciously moist, it was fantastic. Another positive note about our turkey burger was the amount of goat cheese loaded onto this burger, there was no shortage of cheese which makes for a super tasty burger! Our other burger was a beef burger (a blend of Angus chuck, brisket and short rib). We topped it with an onion ring, fried egg, jack cheese, and KGB sauce (similar to a thousand island dressing). This was a beast of a burger! The onion ring was super crispy and delicious! Now let’s talk sides, because we all know that a burger can be made better or worse depending on the side it is served with. We tried the Parmesan-Panko onion rings and french fries. Both were great! The fries and onion rings were that perfect crispiness and seasoned well! Not going to lie, but it would be worth the trip just to have their fries and onion rings with a beer! Other side options include: coleslaw, house salad, and grilled vegetables. We had a lot of fun coming up with burger ideas at Burger Theory. If you like being in control of your own burger destiny, you should definitely check them out! Where are some of your favorite places to grab a burger? Leave a comment below or use the hash tag #GeekEats.